The Lagoon invasion has begun, so this week we’re picking our favourite extra-terrestrial invasions! 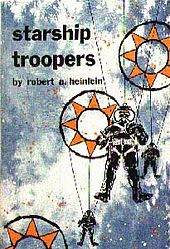 Which leads me to Heinlein’s controversial masterpiece and his alien enemy, no doubt the inspiration for Scott Card’s insectoid space invaders, the arachnoid species known as ‘Bugs’. In a future world where twentieth-century Western democracies have collapsed from threats both self-created and from outside, Citizens of the Terran Federation can only vote if they have given two years of their life in voluntary Federal service. The message is social responsibility requires personal sacrifice. Our hero, Juan Rico, signs up and is drafted (against his will) into the most dangerous branch of military service, the Mobile Infantry. Equipped with nuclear weapons and powered armour suits these shock troops export their brand of apocalyptic violence to the planets invaded by the Bugs and in revenge for outrages perpetrated on Earth (Buenos Aires and Rico’s mother are vaporised during the course of the novel). The book intersperses explosive, visceral action that puts you right in the powered pants of one of these troopers with longer, philosophical passages where suffrage, civic virtue and the threats of self-indulgence and delinquency are discussed. Characters mouth sentiments like: ‘The noblest fate that a man can endure is to place his own mortal body between his loved home and war’s desolation’. The book has featured in more than one late night discussion amongst a group of us old-time SF fans who get together for a glass of wine and a bit of gaming every couple of weeks. Some point to Heinlein’s new earth order being militaristic and akin to Nazi Germany or Sparta, others that, in fact, its laws are not that different from those of modern Switzerland. Whatever the answer, the book is an enduring military SF classic, has really creepy aliens, and is a launchpad for vehement debate (which my group is strangely fond of). 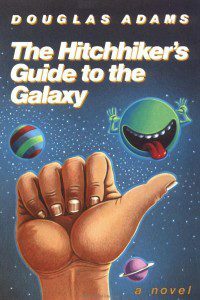 In a way, my choice isn’t so much an alien invasion as it is an alien seizure of property; an alien exercise of eminent domain: the Vogon demolition of Earth in The Hitchhiker’s Guide to the Galaxy. My attraction to this particular ‘invasion’ comes from the fact that it’s not an invasion. Why would aliens invade our silly little planet, anyway? I mean, really; if they’ve mastered the art of faster-than-light travel, for example, what delights could the Earth possibly hold? So it’s far more believable that, indeed, it holds no delights, and is instead just a (literal) bump in the great space superhighway of life. Plus, Earth’s demolition kicks off Arthur Dent’s adventures with Ford Prefect. And, as those adventures include being tortured with a selection of Vogon poetry, I can’t complain. What can I say? I love the Vogons. Here is what to do if you want to get a lift from a Vogon: forget it. They are one of the most unpleasant races in the Galaxy. Not actually evil, but bad-tempered, bureaucratic, officious and callous. They wouldn’t even lift a finger to save their own grandmothers from the Ravenous Bugblatter Beast of Traal without orders – signed in triplicate, sent in, sent back, queried, lost, found, subjected to public inquiry, lost again, and finally buried in soft peat for three months and recycled as firelighters. The best way to get a drink out of a Vogon is to stick your finger down his throat, and the best way to irritate him is to feed his grandmother to the Ravenous Bugblatter Beast of Traal. On no account should you allow a Vogon to read poetry at you. Six years before the events of the film, a Nasa probe has been off investigating alien life and upon return crashes into Central America. Tentacle-waggling monsters start cropping up and Mexico is cordoned off as an infected zone. As the infection spreads, the US prepares to close its borders and two Americans trapped in Mexico race against time across the infected zone. It’s a plot wide open to James Camerson-esque special effects and starry-eyed romance, but Monsters avoids that. There’s an interesting political subtext, but first and foremost it’s an atmospheric character piece with expertly deployed low-fi special effects (produced on the director’s laptop!). An understated alien invasion, if there is such a thing! My favourite Alien Invasion is going to have to be 2002’s ‘Signs’ starring Mel Gibson. Oddly I watched this only the other day and it genuinely does still freak me out as much as it did when I was 12. I remember being terrified in the cinema back in 2002, particularly during the part in the film when the footage of the ‘alien’ spotted in Brazil is shown with it walking across the screen … it still gives me the shivers thinking about it. But then again, I am a massive wimp. Signs is a really fun alien invasion film that I would recommend to anyone! I. Loved. War of the Worlds. Yes, that 2005 version with Tom Cruise. Why did I love it? I loved it because I enjoyed hating everything that the feckless son Robbie did. Dakota Fanning was a revelation, and I have been completely in awe of her ever since. Because the noise those tripods makes me want to curl into a ball and hide. Also, the heartwarming ending that everyone hated? Fine by me, I’m the kind of sap that likes a happy ending. I still don’t entirely understand how these aliens were defeated. Something about germs, it seems. We germy, phlegmy humans brought down the big scary tripods, and you believe it completely and utterly because it’s Morgan Freeman who tells you about it over the end credits. I think the sign of a good ‘alien invasion’ storyline has to be something that leaves you thinking ‘what would I do?’ When I watched War of the Worlds in 2005, we were living on a farm on a quiet and windswept Derbyshire moor. And I remember looking out of the window and thinking ‘I think we’d be fine if we just hid in my sister’s wendy house’. After all, what sort of alien invasion cared about the English countryside? And if it did I could just try coughing on it and see what happens. I’m not too sure if Cloverfield is actually an alien invasion film, because to be honest (SPOILER) there were rumours that it was a creature awakened from the falling meteor at the end of the film. God knows! This film was great for many reasons, I thought that it avoided being boring which is a MAJOR issue with films that go for the ‘shaky camera’ style. Attempting to depict real life can sometimes work too well and lose the pull of the cinematic experience. Cloverfield balances this nicely, most likely because it is crazy eventful and full of good actors. It has some awesome scenes that I can’t get enough of, one of my favourites is when we get a glimpse of the monster and then we see the army rushing in – ridiculously intense and excellently done! If that doesn’t make you want to watch the film… well, I can’t help you.